Your child will take a cross-country tour in Level 2! Level 2 is designed for a student who has mastered the 36 steps of the Level 1 Program. The emphasis is on reading as a means to learning. Reading, writing, spelling, grammar, and comprehension are integrated with social studies, drama, and music for a more dynamic program. In this level your child will build a powerful 1,440-word spelling vocabulary, as well as transition from manuscript to cursive writing. In the Level 2 storybooks, your child will be introduced to different states, cultures, and communities across the southern and eastern United States. The tour continues as your child visits the northern and centrals states, and also Mexico, and Canada in the Level 3 storybooks. 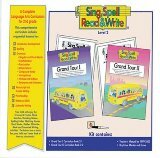 The Level 2 Home Kit includes the student books, Grand Tour I and Grand Tour II, an answer key for each book, and an 8-page booklet for cursive writing instruction. The additional components, which make Level 2 a complete language arts program, are listed below. Sing,Spell,Read & Write Level 2 is the natural progression from learning to read to emphasizing reading as a means to learning. 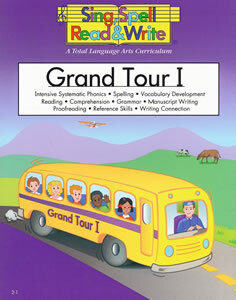 Grand Tour 1 Student Workbook is the 1st workbook in the Sing, Spell, Read and Write 2nd grade kit. 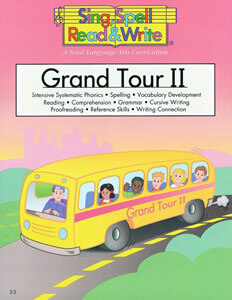 Grand Tour 2 is the 2nd workbook in the Sing, Spell, Read and Write Level 2 kit.